Peter Cheney visits St Colman’s College, Newry, to find out how iPads are helping students to explore their subjects in a more interactive way. While its history dates back 191 years, St Colman’s College in Newry now finds itself at the cutting edge of using technology in education by rolling out iPads to its junior students. “We’d be very proud of the fact that we are innovative and outward-looking in our intentions of providing the highest quality of learning and teaching for the students in our care,” principal Cormac McKinney explains. Its iPad strategy aims to provide devices to all students, initially in the first, second and third years. The first devices were issued to first years in 2013 and agendaNi visited the school on the day that this year’s entrants received their iPads. At present, 375 iPads have been distributed among a school population of 905. Christmas seemed to have come early in the first years’ classroom with students’ attention fixed on the tablets. ICT teacher Kevin Franklin, who is leading the initiative, remarks that the iPads are used across all subject areas. This removes the need to book an ICT suite or investing in laptops, which needed to be upgraded after a few years. 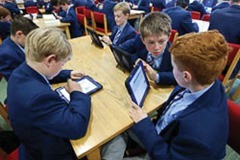 The school knew that Wi-Fi was going to be introduced into every school in Northern Ireland, which led teachers to consider whether a personal learning device would be better. In that way, every classroom would become an ICT room. Wi-Fi is administered and filtered centrally by c2k. This does cut down on the number of books required. Teachers can also design iBooks – e.g. through the Book Creator app or iBook Author software – to present information and worksheets where answers can be written in by stylus. Some iBooks are 80-90 pages long. iBook Author allows videos and quizzes to be embedded. In terms of finance, some schools have used hire purchase payments or covered all costs for the devices. Both options were ruled out as St Colman’s wanted the students to have a sense of ownership of the product. The school therefore paid upfront with parents contributing just under 50 per cent of the cost over the course of a year. The primary use is for education in the classroom but the device can also be used in their free time at home. The strategy “wouldn’t work unless every student had one” and families in financial difficulty can discuss their situation with the principal. The device can also be used as a personal organiser and allows staff and students to email each other more frequently. Older teachers are also taking to it, using the device as an add-on to art and English lessons. As the students move up into GCSE and A-level, the school hopes to save money on photocopying and the purchasing of textbooks. Two groups of first years visited the Apple store in Belfast for an end-of-term trip and the staff were impressed by their proficiency in using the iPads. Using the virtual learning environment, one student shows his animation for Irish and art – a video clip based on cut-out pictures of pupils with a voiceover in Irish, made using the Puppet Pals app. Another student has produced a video on how to prevent and report cyber-bullying. The iPad mini was initially used but feedback suggested that it was difficult to write on it, due to its size. Some of the benefits have included lighter bags – with fewer books. Forgotten usernames and passwords tend to be the main problems. It took a while to get used to the devices but the second years say that they would now feel confident in helping first years to use them. “It’s handy in classes because it really puts off the extra weight off your bag,” a second year, Bram, says. Pages – a similar application to Microsoft Word – is used every day in science but also in history e.g. to present a project on slavery. French vocabulary can be recorded as the year goes on and transferred to the next year. A teacher can also upload verbal guidance in a voice file. Last night’s homework had involved pupils designing comics using French quotes and photos of themselves. The iPad is therefore “another tool in the toolkit” for teaching and learning.